This was an indexing project prepared for the texts of the volume commissioned by the editor, Prof. Oyeronke Oyewumi of SUNY, Stony Brook University. The volume is available for order on the website of the publishers, Palgrave Macmillan (http://www.palgrave.com/home/index.asp) and all major online retail stores including amazon.com and Barnes and Noble. This is the first comprehensive reader that brings African experiences to bear on the ongoing global discussions of women, gender, and society. Bringing together the essential writing on this topic from the last 25 years, these essays discuss gender in Africa from a multi-disciplinary perspective. With a theoretical and conceptual focus, African Gender Studies will inform debate in African Studies, Women's Studies, History, Sociology and Anthropology. 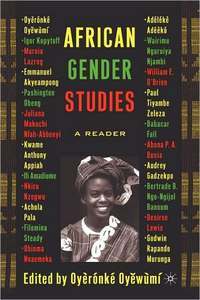 “This book is a must read for scholars and activists, interested in the post-modern debate on Gender Studies in Africa. The multi-disciplinary essays provide timely, refreshing and provocative illustrations of the philosophical and epistemological complexities, challenges and dilemmas endemic to universal theory building. It is a constructive critique of the flaws, inherent in Eurocentric and androcentric scholarship that have dominated studies of gender in Africa and represents a culmination of the process of deconstruction and revision. The contributors successfully interject African-based concepts, explanatory paradigms and experiential knowledge into the various strands of the dominant feminist discourse." "For the diversity and renown of its authors as well as the breadth of its topical coverage, this book deserves a wide reading. Its subject matter, African gender studies, is important not only for Africa but also for its ability to affect both the discourse about and action on global issues dealing with gender, 'development,' and social and economic justice. " —Cheryl Johnson-Odim, Dean, School of Liberal Arts & Sciences, Columbia College, Chicago and author of For Women and the Nation: Funmilayo Ransome-Kuti of Nigeria. "This collection should be read by all interested in a truly international gender analysis and feminist theory and scholarship." Oyeronke Oyewumi teaches sociology at State University of New York (SUNY), at Stony Brook. Dr. Oyeronke Oyewumi is the author of The Invention of Women: Making an African Sense of Western Gender Discourses, which won a 1998 Distinguished Book award of the American Sociological Association, and was a finalist for the Herskovits Prize of the African Studies in the same year. Oyewumi is also the editor of the anthology African Women and Feminism: Reflecting on the Politics of Sisterhood.